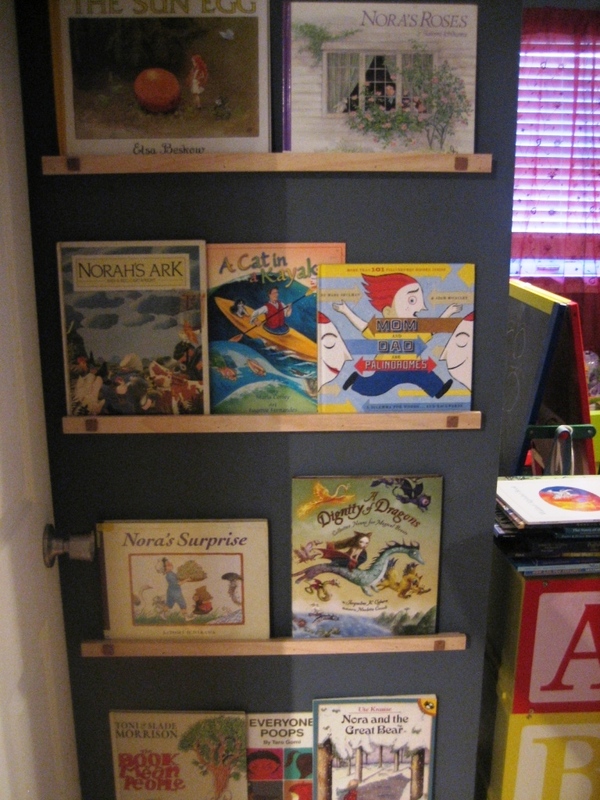 I came home from the Blessingway yesterday–which was wonderful, by the way–and found my Mr. Handyman made these wonderful shelves for Norah’s room. The wall has such a tiny clearance from the door. But these narrow shelves are perfect for a book display. And Norah will enjoy changing out her books in her crazy love for patterns and arrangment. I admit that I had fun arranging this display. Did I ever tell you guys that I secretly long to be a librarian? And even majored in library science for a semester? Yep. A whole semester. That was between the pre-med and anthropology semesters. 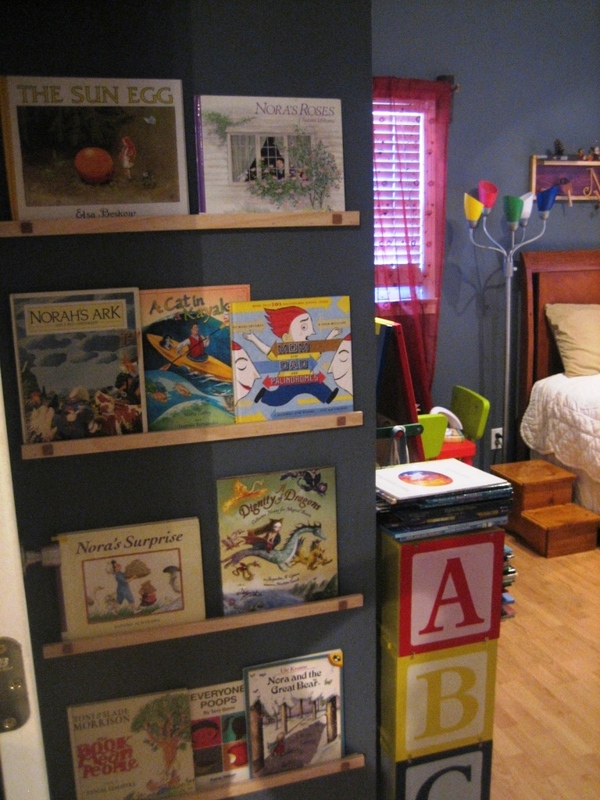 Posted in Family and tagged book display, bookshelves, small space library. Bookmark the permalink. Yeah, I went a little crazy when I was pregnant buying “nora(h)” books. I’m in trouble when it come to Cedar. I have found a chapter book series about a clever girl named Cedar B. Hartley. It is out of print but I’ve found them here and there. Isn’t it great being married to Mr. Handyman? I am too. Wonderful! Lately John has become obsessed with installing step lights along our staircase. I admit, they are dark and I’ve been creeping up and down them. But we’ve lived here for 3 years without incident. I pointed this out to him and he said, “Yes, but now you’ll be carrying the baby.” 🙂 In other daddy cuteness… the night we came home from the hospital we were both exhausted. It was very late. As I got settled in and just wanted to collapse into sleep, I noticed him carrying Morgan around the house turning on the lights in each room. What was he doing? He was giving a tour of her new home and describing all the improvement projects he and I had done since we moved here. Gotta love that man.